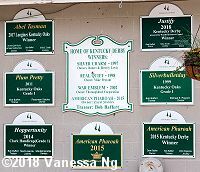 The signs at Bob Baffert's barn showing all his big winners at Churchill Downs. 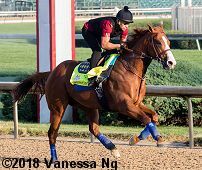 Several of the contenders for the 150th Belmont Stakes contenders are currently training at Churchill Downs, including Kentucky Derby and Preakness Stakes winner Justify and Preakness runner-ups Bravazo and Tenfold. The weather is currently looking pretty good on Belmont Day, partly cloudy with temperatures in the mid-70s. After all the rain for Derby and Preakness, the Belmont looks like it might be dry, thankfully! 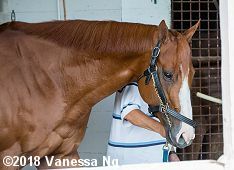 Here are some photos from Friday afternoon and Saturday morning with five of the Belmont contenders. 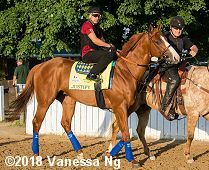 2018 Belmont Stakes Contenders -A field of 12 is expected so far headed by Kentucky Derby and Preakness winner Justify. Left: Justify walking the shedrow on Friday afternoon. 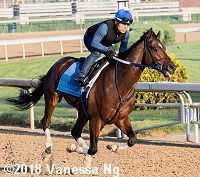 He schooled in the starting gate and galloped about 1 1/8 miles Friday morning at Churchill Downs as he prepares for a sweep of the Triple Crown in the June 9 Belmont Stakes (GI). "He's just breathing fire out there," trainer Bob Baffert's assistant Jimmy Barnes said. "You can tell he's feeling full of himself. He's happy with what he's doing and that's most important. He is getting fitter and fitter each day. He has a solid foundation under him now and I think he's ready to take the big step forward." Right: Justify heads out to the track on Saturday morning. 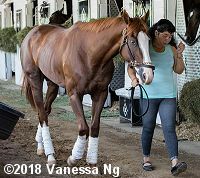 Justify galloped 1 1/2 miles on Saturday morning under exercise rider Humberto Gomez. 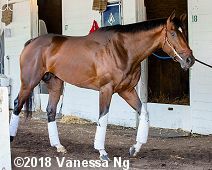 Jimmy Barnes, assistant to trainer Bob Baffert said, "Every day he's been training well. He's just full of energy and happy. We went 1 1/2 miles today and it was pretty quiet with just a few horses on the track. He was really professional today. 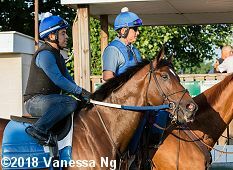 He'll have one more gallop day tomorrow (Sunday) and I'll let Bob take over and do his thing." Baffert will be on hand Monday morning for a scheduled breeze before shipping to New York for his attempt at the Triple Crown sweep. 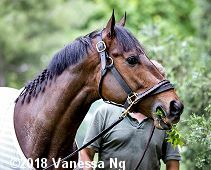 Bravazo grazing on Friday afternoon. Bravazo breezed one mile in 1:42.60 on Thursday. Trainer D. Wayne Lukas said, "I was very pleased with the work. With workouts, I'm not really looking at the time but rather how they're doing it. He did everything we asked. You have to be a tough horse to compete in the Triple Crown series and I think we have a tough horse. He didn't really get a whole lot of fitness from the Louisiana Derby to the Kentucky Derby with the time between races. 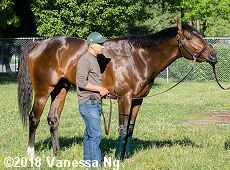 I think the Derby made him a lot more fit and that's part of the reason he did so well in the Preakness." 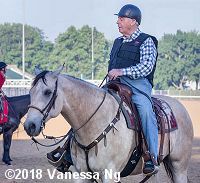 Left: Trainer D. Wayne Lukas out on Saturday morning. Bravazo returned to the track to jog 2 miles for trainer D. Wayne Lukas after breezing 1 mile in 1:42.60 on Thursday. 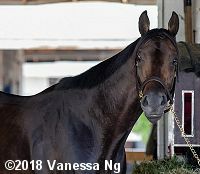 He was a close 2nd in the Preakness (G1) after finishing 6th in the Kentucky Derby (G1). Right: Bravazo grazing after going out to the track on Saturday morning. Tenfold walking the shedrow on Friday afternoon. 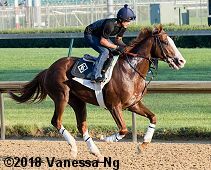 The 3-year-old son of Curlin, out of the Tapit mare Temptress, won his first two starts at Oaklawn Park but ran a subpar fifth in the Arkansas Derby (GI) prior to his Preakness third. Trainer Steve Asmussen said, "I've had a lot of success with Curlin and Tapit offsprings. They've also done very well in the last four or five runnings of the Belmont Stakes. Even though he's lightly raced, I think Tenfold is very talented and getting better at the right time." Tenfold breezed 5f in 1:01.60 under exercise rider Angel Garcia, through fractions of 12.60, 25.20, 37.20 and 49.20 then galloping out 6f in 1:15 and 7f in 1:28.80, as timed by clocker John Nichols. 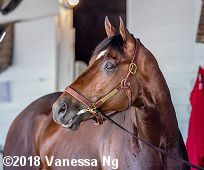 Trainer Steve Asmussen said, "We were 3/4 length from where we needed to be in the Preakness. He's lightly raced and his best races are ahead of him. I think he deserves the opportunity in the Belmont Stakes. I have nothing but respect for the field, not just Justify." Restoring Hope walks the shedrow on Friday afternoon (left) and Saturday afternoon (right). 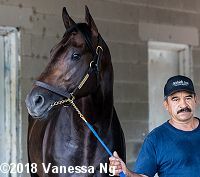 Like stablemate Justify, he also galloped 1 1/2 miles on Saturday under exercise rider Humberto Gomez. Jimmy Barnes, assistant to trainer Bob Baffert said, "Restoring hope is also doing good. He galloped well this morning and has been training forwardly."